UWB Photo Blog 2 | United We Blog! 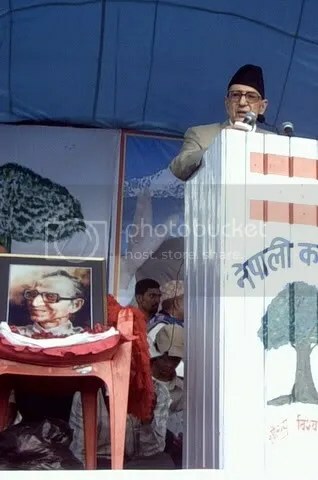 The 80 plus year old Prime Minister Girija Prasad Koirala still has the same energy that he used to have in his young days. This man, the most powerful prime minister of Nepal, went to India the day he took oath in the parliament and addressed the meeting of SAARC in New Delhi. Back in Nepal, he was in Pokhara to address his party Nepali Congress’s mass meeting. Here is a report by Neil Horning All pics by Neil Horning. Maoist affiliated girls on the back stage put on make up and do their hairs before going on the state to perform dance. The show clearly belonged to Prachanda because it was organized specially for him. Maoists wanted to make it high sounding and portray the event as a really big thing. They also wanted to portray their leader Prachanda as the Next Big Thing in Nepali politics. Krishna Bahadur Mahara’s introductory note, two minutes before he invited Prachanda on the mike, were full of adjectives and praises for Prachanda. I mean even Prachanda must have felt uncomfortable with such words. All central members of the party seated on the dais were presented with a garland of marigold except Dr. Baburam Bhattarai and Prachanda. Dr. Bhattarai had two garlands where as Prachanda had three. Prachanda removed the garlands a few minutes before taking on to the mike. UWB Photo blog: Southern Nepal demonstrations For the record, images from Feb 6. Four more people in Siraha died today due to the cold wave that has hit the Terai region hard in the last few days. The death toll in Siraha district alone has reached 9 till date, totaling to 22 in the eastern Terai. Though precautionary measures have been taken, because of improper management, the cold wave has been claiming lives in the Terai region everyday. However, the district police said that there is no data available on the deaths due to cold only. According to Kantipur, Jagdev Yadav, 70, Mahesh Mahato, 65 and Ramdev Kamati, 55 of different villages in Siraha died of the cold wave today. Similarly, Jhagal Majhi, 45 of Bara died Wednesday night. Due to the heavy fog that covers the region whole day has forced the elders to stay put at home, whereas the schools are seeing students in the classrooms in small numbers. With the mercury also falling down sharply along with the cold wave, minimal commercial activities have been noticed in the region. Earlier, three people had died in Rautahat alone due to the cold. The deceased were Chamelia Devi, Ram Lakhan Mahato, 85 and a yet to be identified 65-year old woman. Previously, the cold wave had already claimed three lives in the same district. Likewise, due to the extreme cold, over a 100 primary schools have been shut down in the district. Three people have succumbed to the severe cold in Bara. Sushila Khatun, 28, Sahudari Devi Shah, 65 and Shah Dev Mahara, 50 have lost their lives to the cold wave. Earlier, an Indian citizen had also died in Bara due to the cold. Similarly the cold wave also claimed a life in Siraha where earlier five people had died due to the excessive cold. Maoist Madness: Crazy Comrades Stop This Nonsense! There is a saying in Nepali that burning candle becomes extra bright seconds before dying. Is CPN Maoist that candle? If not why they are behaving like so? Why are they are continuing harassing general Nepali public even after signing a pace agreement with the government? They are forcefully abducting teenagers to recruit in their army, torturing people in the name of Peoples’ Court, threatening villagers to provide them food and shelter, extorting money from tourists and threatening journalists who write against their party. In the past few days, these Maoist activities are increasing alarmingly. Maoists in Biratnagar, Itahari, Ilam, Tehrathum, Sankhusabha, Sarlahi, Dang, Banke and other districts have abducted teenagers younger than 16 years to recruit in their Peoples Liberation Army. In Itahari, they have threatened to take physical action to a journalist for writing news critical to the party where as in Udayapur they have intervened in a cultural program. In Manthali, the district headquarters of Ramechhap, they Maoist has arrested and tortured two in charge of murder, according to locals. In Kumarwarti VDC, Nawalparasi, Maoist cadres have forcefully taken away farmers’ rice. They have abducted three minor girls in north-eastern Samjong VDC of Dhading district. Those girls, all 14 years, have been identified as the 7th (Dilmaya Himrung and Gorimaya Lama) and 8th (Phulmaya Himrung) graders in Chautara Secondary School. Parents of the abducted girls have demanded their safe return. In Deuri Bazar of Udayapur, Maoist’s Kirat National Liberation Front intervened in a cultural program organized on Tuesday night, arrested artists and spectators for two hours and ordered for the program to be stopped. In the program organized by Naulo Bihani Sanskritik Abhiyan, four people including Front’s Jeevan Kirati intervened, said Mohan Gole, chair of the Abhiyan. Maoists have arrested two people of Kuvu Kastali village in Ramechhap district for their alleged involvement in the murder of Bishnu Ghimire in Khiji village of Okhaldhunga district. Maoist cadres have said that they will be handing over the two to District Police Office, Ramechhap after investigating. In Terathum, 40 boys and girls have ran toward Maoist cantonment after Maoist promised them attractive salary. In Sankhuwasabha, Maoist has continued recruiting in PLA. In the photo above, a reble poses with a UN official who was there to visit a cantonment site. In Pokhara, Maoists have started making hotel and restaurant laborers their cadres overnight and taking them to cantonment site. They took more than 200 laborers from hotels and restaurants in Pokhara on Wednesday alone. They were taken to the Maoist cantonment site (see pic below) at Chirtung village in Palpa. Laborers were boarded into a bus with the license plate number Ga 1 Kha 1891. In Morang’s Sundarpur and Dulari villages, more than a dozen school children have been forcefully taken away to recruit in Maoist PLA. Parents staged a sit-in for about an hour in front of the office of Maoist eastern command at Salakpur. Meanwhile, reporter of Gorkhapatra daily Ambar Khadka and Suman Puri of local Udghosh daily who had been there for reporting were threatened by the Maoist. “We can do anything to you if you write news about this,” a reporter quoted Tulasi Sinkhada, chief of Dulari Village Peoples’ Government and Sundarpur’s Agni Sitaula, threatening them. In Gothgaun village of Ramechhap district, Maoists barred children from meeting their parents. Those children were being taken away for recruitment.